If you have recently started looking at who makes double-sided mattresses, you will see many custom-mattress options online, but few options where you can actually try them before purchasing. Royal Bedding has a showroom in front of our mattress factory so that you can try our double-sided mattresses for support and comfort before buying. When looking for a custom double-sided mattress, there is no doubt you will be considering the price. At Royal Bedding, we have a range of high quality “custom” mattresses that vary in pricing to fit your specific budget. When you choose a mattress made by Royal Bedding, you can “rest” assured that you are receiving a mattress that matches or exceeds the quality found anywhere else for the price. The best two-sided mattress can be yours with Royal Bedding’s range of flippable mattresses to accommodate all budgets. We offer entry level, mid-level, and premium mattresses, each of which comes with distinctive benefits and in our opinion (and our customers! ), provides superior comfort at an affordable cost. When you buy a custom mattress, you want something that is going to withstand the test of time. After all, you are investing in something you want to last. Above all else, you want to get a comfortable custom mattress that you will enjoy spending time on. Our entry level quality twin mattresses start at $139, with larger sizes available. As with most mattresses, the cost of the mattress can depend on the features you desire. 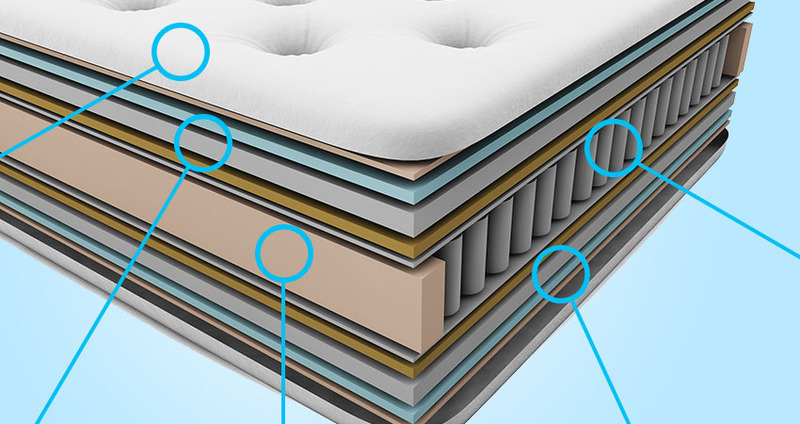 Royal Bedding proudly offers entry-level mattresses that provide more padding with a higher-grade of materials for a lower cost than most of our competitors. 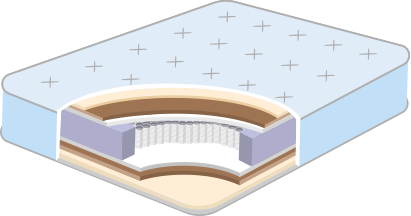 There are many mattress manufacturers that load their one-sided mattress with plush padding, which feels great to begin with, however; after a short period of time you end up in a hole or groove that is very difficult to role out of. We provide quality two-sided spring, foam or latex mattresses that will provide you years of good comfort and support. You will find that at each price point Royal Bedding’s mattresses offer more “bang for the buck.” With this, you get a better level of support that lasts far longer than most of our competitors. Our completely custom mid-level quality mattresses cost from $1,800 to $2,500+ dollars. Royal bedding provides the best innerspring, foam, and latex mattresses. Our range of premium mattresses have padding on both sides, and we use upholstery grade foam or latex, which is by far the best padding option for mattresses. This provides you with the best support, durability, and comfort. At Royal Bedding, we are proud to service the needs of any client who requests something a little bit different. Our custom mattresses can be made to fit antique beds, cabins, yachts, custom built-beds, special need beds, motor homes and any other application of your choosing. However big or small your specifications, we can make a special sized mattress for you that you will be proud of and enjoy spending time on. While pricing for custom mattresses can vary depending on the size, Royal Bedding offers superb value across our entire range, and this includes our custom-sized mattresses. What About A Bed In A Box? We know many of our competitors offer a bed in a box and some will even give you a free trial at home. However, have you considered what they do with the mattresses that are returned? Could you be ordering and sleeping on one of these returned products? What about the companies that allow you to donate the mattresses to a charity? Are they making that much money that they can afford to write these sales off? (By the way, the Federal Government no longer allows charities to accept mattresses that have been slept on, no matter how short or long the time period) You may need to consider what value and what quality of components you are actually receiving in your mattress if they can afford such deals. There are also weight limits that the freight companies allow with mattresses shipped in a Bed in a Box format. Royal Bedding has designed a two sided mattress that competes with these Bed in a Box companies, giving you higher grade materials at a lower cost. We believe you will choose Royal Bedding’s mattress when you take the time to compare. 8 Tips For Sleeping Better! At Royal Bedding, we are an ethical double-sided mattress manufacturer. We are the only company in Alabama that can take back your Royal Bedding mattress, take it apart, and then rebuild it. This is something our customers appreciate, and we know that is makes us unique. We can make it firmer or softer depending on your specific feedback, and we do the labor at no additional cost to you. We strive to deliver real value by offering the ability to change the composition and feel of a newly purchased mattress in the event you need changes. We don’t just want our customers to be happy, we want them to feel satisfied. Going the extra mile is all part of our standard service.